A Russian émigré who was one of the original California Greens, Marc Sharon passed away in West Los Angeles in October, 1998. Sixty years earlier, he worked with Leon Trotsky in Norway. Before his passing, Sharon admitted to being over 90. Sharon’s lifetime took him from Russia, around Europe (including fighting in the Spanish Civil War), to New York and San Francisco, before settling finally in Venice. In 1938, he was stopped at the French/Spanish border trying to enter to fight in the Civil War, then after producing a picture of him with Trotsky, was allowed to pass. 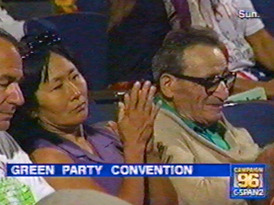 In 1985, Sharon was part of the first group of California Greens that began to meet in Los Angeles, along with Genevieve Marcus, Bob Smith, John Stein, and others. These meetings, along with concurrent meetings in the East Bay and San Francisco, laid the roots for the Green Party to form in California. In June 1988, the Green Committees of Correspondance held its national Green Council meeting at UCLA. Building upon this momentum, Sharon founded the Westside Greens in the Santa Monica/ Los Angeles area, and the Green local quickly became one of the strongest in the state. Then in February 1990, the Westside Greens were one of the 27 locals to vote in favor of starting the Green Party of California, with Sharon in support. Over the years, Sharon hosted many Green meetings in the community room of his senior affordable housing building in Venice. Until the end, he remained very sharp of mind, always focusing on strategy. A voracious reader, he kept abreast of Greens in Europe as well as the US. In October 1990, Sharon and fellow California Green Michael Feinstein represented US Greens to the European Green Coordination meeting in Bonn, West Germany. In August 1996, in his 90s, he got to see Ralph Nader's presidential acceptance speech at the first Green presidential convention at UCLA.